A lot of people having been talking up Bottas lately. More so, it seems, than Ric. Which I find odd. I was talking about this recently with someone and they said they thought Bottas was being mentioned as a future WDC more frequently because his coming of age has been intertwined with the resurgence of Williams. Either way, these two seem to be the cream of the crop when it comes to the mid-20's aged drivers. Good stuff, thanks for sharing! Although I don't quite agree with you that Bottas has been talked up more than Ricciardo lately. On the forums Ric's talked up. The fans know their stuff. But the people who work in F1 like the Sky commentators and people outside Red Bull like Mallya*, for example, seem to sing Bot's praises more than they do of Ric. Pat Symonds was (understandably) recently talking about Bottas as a future WDC. The next Hakkinen, and all that. You don't hear a lot of that kind of stuff being said about Ric in the media, even by Red Bull. Yes it is strange and you are correct to a point. But do you really find all these people experts? Last year all the paddock was raving how Vettel is 1 of the GOAT after smashing the record for 9 straight wins. Nobody suspected it was possibly the car and Webber with the steel rod in his leg was way way past it. And nobody in the paddock even remotely suspected that Ricciardo this year would have ZERO chance against Vettel in the race. But dam how wrong they all were. Not only did Ricciardo not get beaten. Not only did he match Vettel, which would have been a shock just like Rosberg sometimes matching Hamilton has been a shock. 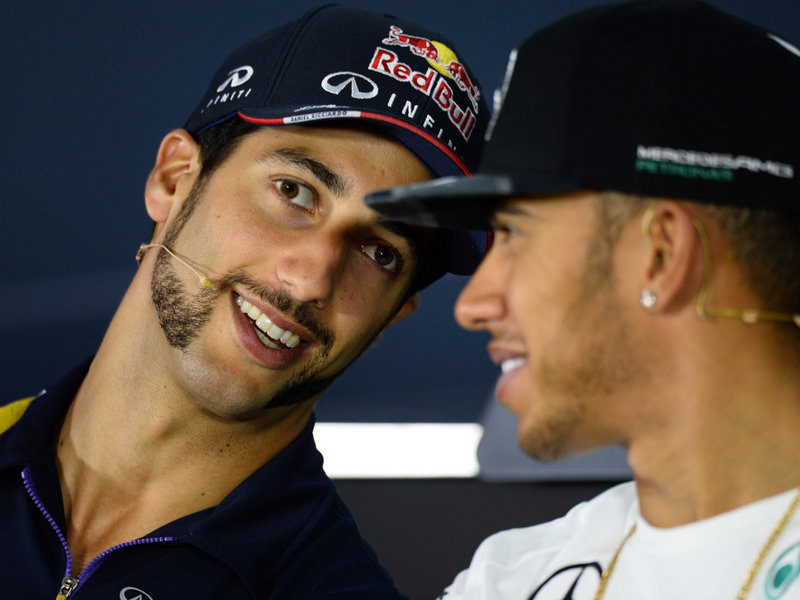 Ricciardo has crushed him all year in undoubtedly the largest gap to a team mate all year. Major shock. So ye the paddock and commentators seem to have zero idea. The fact they got it so so wrong shows you that sometimes they seriously have no idea. Just like when you listen to Bloomberg or whatnot and all the finance experts on stocks. They have done comparisons where a monkey throwing a dart at a board outperformed all these hardvard/princeton graduated wall st experts. The monkey actually made a profit where the wall st experts took major losses. Ah, Petter, do you really have to turn even this thread into your obsessive "Let's bash Vettel" sand box? Not enough of other threads? Crashed in undoubtedly the largest gap to a team mate all year? Now, that's undoubtedly false, probably even a lie. You, of all, ought to know better. Even in terms of the absolute point difference, Kimi fares worse and Massa same. But really, what you should look is the relative points in % and there you will find more drivers being outscored by their teammates worse than Seb by Ric. Just an example: Kvyat's 8 points to his teammate's 19 (less than 50%). You can do your own math for others. The guy asked a legitimate question about Driver ratings from the paddock. And what bigger driver rating fiasco than Vettel the last few years to use an example and how wrong everybody was. Sorry if it doesn't you. Why didn't you instead answer the guys question in your own words if you had a better response. You bashed my reply yet instead. How is that helpful to the original poster's question? Also you should know better that between Kyvatt and Verge if you watched the races the gap was alot closer than what the points show. Raikonnen though gap wise in races has not been so bad and is improving. So it is fairly even i believe with Raikonnen and Vettel. But alot of people knew Alonso would beat Raikonnen after seeing how easily Alonso beat Massa where Raikonnen struggled against. So that was kind of expected by most people. Ricciardo winning was not expected by all the so called paddock experts. Raikonnen though gap wise in races has not been so bad and is improving. You can genuinely write that and not acknowledge the same about Vettel? I never really rated Vettel either, but I don’t believe he won 4 WDCs purely due to the car. He may not be the most naturally quick but think there is a lot more too him. The gap between the two is much, much closer now in qualifying and you have to expect the tyre management to follow. I really hope they are both at Red Bull next year as I'm really enjoying this little team battle. Back to the original posters question, are the so called experts basing their opinion on the careers to date, and particularly their junior careers. Think I've seen the clip before, and it’s very nice from DR but am I right in thinking that Bottas won a bit more as they were coming through the ranks. That said DR has been great this year, and people will only talk about him more and more if he keeps up this level. This was a really great piece. Thanks for the heads up on it. Ye great find. Shows you really need to start very young and your family has to invest alot of money and make many sacrifices to get you to F1. Looks like it's been taken down already FOM? It's on youtube, although not exactly the best quality. "Stop it man, I'm supposed to look serious." Guys, remember Top Gear isn't considered an F1 topic, nor is it considered appropriate for the motorsport section of the forum. Please continue those discussions in those relevant threads. What do we think Dan the Man's chances are this year? With the new Renault development program and Ilmor on board, will the "Tag Heuer" engines be better than previous years? Can Dan get some race wins in 2016? Race wins - as in 2014: not on pure merit, I think. Question is whether Renault's indecisiveness throughout most of 2015 whether to either come in F1 as a full factory team or leave F1 altogether hasn't hindered development of the PU. I'm guessing they wouldn't have been fully committed before they decided they were "in", and that wouldn't have benefited the PU. Also, not much gains were made throughout 2015 and even late 2015 the signals they gave indicated they still had no clear development direction to become competitive. Not long ago I think it was Abiteboul saying how they were aiming to halve the performance difference to Mercedes by the beginning of the 2016 season - but essentially, he was comparing with the final incarnation fo the 2015 Merc PU. So all in all, I'm not optimistic for Red Bull and if STR manage to create a good chassis again, they might give RBR some serious in-house competition. Things could start looking up for 2017, but this year I don't see it. Pessimistic about 2016. Hopefully some good points, but fewer than 2015. No surprise podiums like those in Hungary and Singapore. Looking toward 2017 and an either a new PU or a new team. Dan seems to be a bit off in the last few races. Is it the car or has something changed with him? Monaco GP - Blindingly fast all weekend. Took pole with a masterful lap. Looked like a seasoned champion. Only lost the win due to team blunder. Finished 2nd. Canadian GP - Another team pit stop blunder, but Ricciardo wasn't looking super quick and made uncharacteristic brake lock ups. Finished 7th. European GP - Great qualifying to start on the front row, but again race pace was lacking. Issues with heat in tyres and making them last. Finished 7th. Austrian GP - Looked OK in qualifying but didn't hit the mark when he needed to. Again tyre issues in the race and a lack of pace, particularly compared to his team mate. Finished 5th. Dan has a reputation for good speed and tyre longevity. Has a change in Red Bull setup following Monaco started killing the tyres? Or has the crushing Monaco result affected him? He just doesn't seem his usual self (in the car). Canada GP- he lost his position to Max when he was forced to lift to avoid Rosberg off the start. He was right on Max's tail up until the first pit stop (and Max ignored team orders). From then he came out behind Raikonen. Ric was not in clear air for any of the race at all, so we never got to see his pace at all. European GP - Max did not get the tyres to last either. The circuit did not suit the Red Bull very well. I think Red Bull took off too much downforce and as a result traction and tyres suffered. Austrian GP - Ric out qualified Max again and is the only driver to have not been beaten by a team mate in quali in 2016. In the race, he had a good start and got up to 4th. Then over the next 6 or so laps, lost position to Hulk, Rosberg, Max and then Seb. And then later after the safety car Max pulled a 7-8 second gap on him in 15 laps or so. So Max had a 0.5 second advantage on a 70 second lap. That says to me that either they had quite different car set ups, or Ric's car might have had a problem. Max is good, and I don't meant to take something away from him, but the difference between the Red Bull guys was probably the biggest in the race in terms of team mate performance. Given Ric's performance in quali we know he is quick. I don't think these races show any pattern of bad driving, more just a bit of bad luck here and there. (and Max ignored team orders). And then later after the safety car Max pulled a 7-8 second gap on him in 15 laps or so. It was more like a 7.5 second gap in 25 laps, which is 0.3 seconds. Anyway, I think over the past 5 races it's become apparent that Verstappen needs work on his qualifying, but is on Ricciardo's level (perhaps a bit above, going by what we've seen) as far as race pace and tyre management is concerned. He had faster race pace in Baku and Austria and was (at least) as fast in Canada and Spain. Monaco is impossible to tell - and of course that's Verstappens own fault. Verstappen is settling in and getting to know the RB12 better and better and it's showing. I don't really think there's necessarily a change in Ricciardo's driving or a change in him feeling the car. It's just that he comfortably had Kvyat's measure before but the latter has now been replaced by a driver that can and does challenge him more on race day. Swap Verstappen for Kvyat and I believe Ricciardo would have been ahead 5-0 for the last 5 races and even with the same results everyone would still think he's getting everything out of the car. There is a report though that in Austria, Riccardo had power problems (around with harvesting) leaving him slower on the straight after turn 6. I didn't watch the race though so I'm just reading news from afterward. MDS we have been through this before. In Canada Max didn't move over, but he also didn't speed up while the gap to the leaders was growing and growing. Max didn't overtake anyone after the first lap on track, and neither did Ricciardo. Red Bull did not have the power to that over Ferrari, Williams and Merc who they were racing that day. Max had 99% clear air, Ric was following a car for the whole race. Spain, Ric was ordered into the pits and was questioning the strategy. So his tyres weren't going off. In Baku, he easily led the Ferrari's in the opening laps but his tyres went off very early. But so did Max's. The only time Max had better pace was in the closing stages, but Ric was closely following Hulk for a long time and in some tracks if you do that, you ruin tyres. In Austria, there were so many overtakes up and down the field all over the place. How can you say Austria is like Canada for overtaking. They are not the same at all. To me the only place Vestappen has been clearly quicker is Austria, and like I said I wouldn't be surprised if there was a good reason for it. As Akeizm linked above, Ric said in an interview he was harvesting too much in the opening stages of the race which cost him the 4 places in the opening laps. The call came right before the SC. After the SC Max slowly pulled out of Ricciardo's DRS range. There was no follow-up call to either speed up or let Ricciardo by. Going by all that it is not fair, nor correct to say that he disobeyed team orders. Sure. All I said was that Max was just as fast - nothing points to the contrary, and Max closing up almost 5 seconds after the stop at a given point could lead one to think he had speed in hand. But I'll settle for being just as fast. You can say what you want about Baku, the facts are that Ricciardo went 3rd to 7th and Verstappen 9th to 8th, a good second behind Ricciardo. If that doesn't point to better race pace I don't know what does. And in "some" tracks you ruin tyres while following? I take it Spain will be one of the tracks where that isn't the case (despite having seen examples of the opposite, the past few years)? Of course they are not "the same". But surely you're not going to say that Canada is a hard track for overtaking? There are a good number of overtaking opportunities and we also actually saw a good number of overtakes this year in Canada. OK, I think Baku too, but suppose we keep it to just Austria: that is still one race more than Ricciardo. And even if there was a technical reason for it - I still think it's a huge accomplishment for Verstappen to be able to run with Ricciardo right from the start. No, he said it "seemed" that way. Nothing conclusive for now. He's up against a different teammate, although his qualifying remains as impressive as ever in the races thus far it's looking like Max has the edge. We're discussing race pace pokerman. It's obvious that Monaco was a stinker of a weekend for Verstappen and a great one for Ricciardo. But it's pretty much impossible to compare their actual race pace on the day. Ricciardo seems to be struggling with the tyres these last couple of races, Monaco excluded because tyre deg is practically non existent there. His tyres just don't seem to last when compared to those around him and he's usually the first to stop, it's something he needs to get on top of. I don't know if it's been an issue all season because the start of his season has been so chaotic with punctures and other incidents outside of his control, but now he's had a few more clean races it's starting to show a pattern. Come on. A start can be bad, but that doesn't mean you have drive slower than your teammate almost every lap of the race. Max is not a good starter at all (his father was). Almost every weekend he loses places in the first few corners. They both seem to stay out of the real chaos in the beginning which is a good thing. Max overtook Daniel, and made a gap. After the SC according to Daniel his technical issue was over, but Max still made a 6+ sec. gap. With his 50 something old tyres Max set his personal best lap. He beat Daniel fair and square in every aspect. Notice how Daniel always talks about 'we' when everything goes down, and 'I' when all goes right. Before MV was him teammate, I really liked him, but now all he seems to do is make excuses. He's clearly no pancake when it comes to racing; he should stop whining before he ends up Sainz 2.0. Last edited by Knuppel1983 on Mon Jul 04, 2016 5:24 pm, edited 1 time in total. The Ferrari, Merc and Force India were very quick and a better package than Red Bull on the day. And Williams had big top speed etc. Imo MDS makes a good assessment of Ricciardo and Verstappen. It must be tough for Dan to have such a fast young team-mate. Probably much like Mark Webber with Vettel, Piquet with Schumacher, Scheckter with Gilles Villeneuve.